We’d love your help. Let us know what’s wrong with this preview of Fate by Kate Bonham. To ask other readers questions about Fate, please sign up. Have you ever read A Touch of Crimson by Sylvia Day? Did you love this book? If so, you will also love Fate by Kate Bonham! Its a modern day look at the battle between the blurred lines of good and evil, Archs and the fallen...Lucifer and Satunas (love that name!) As two different people....and plop right smack in the middle of it all...yup a sassy smart mouth, quick witted heroine!! You heard it right...she is awesome! The story takes you on a journey of love and war, angel wings and heart strin Have you ever read A Touch of Crimson by Sylvia Day? Did you love this book? If so, you will also love Fate by Kate Bonham! The story takes you on a journey of love and war, angel wings and heart strings, and the archangel himself...Gabriel. You imagine Constantine battling demons and Gabriel, well being his normal self! Its keeps you interested in the plot through your reading journey, right to the very end! Be aware all, it is the first book in the Fallen From Grace series...and I s&*t you not, you will hound Kate Bonham to HURRY UP AND FINISH THE SECOND BOOK!!!!! Kate Bonhams Fate....WOW! this book is amazing and being the first in her series it promises to be a cant put down set. Kate paints a world so indepth, so bright and vivid that you will become lost in her world. The Story of Ace and Faye will make you laugh, make you cry, make you excited and make you wish for it to never end. Wow what a blast, this book kept me on the edge of my seat from start to finish. If you love a fight between Heaven and Hell Good and Evil or somewhere in between this book is for you. Im so in love with Lucifer i know its so wrong as the main character is Ace but i so loved his character. This story has so many OMG moments and surprises and a major cliffhanger at the end so its very fast paced. A fantastic first book from Kate Bonham. I cant wait now for book two in the series. I love stories about angels fallen or otherwise! this one did not disappoint. I enjoyed the details and plot I loved the characters.. a fast paced read that left me wanting more.. a awesome story that drags you into amazing worlds from heaven to hell and whats inbetween!! Action, adventure, love and betrayal..
but not your regular Good Vs Evil story expect some omg Moments that keep you on the edge of your seat! Wow what an amazing introduction to a trilogy. Ace is a reaper who goes to earth to claim souls and guides them back to purgatory while they wait for judgement. Faye has always felt like a outsider until one day a man comes to claim her soul. Ace and Faye must battle for their lives while trying to battle their attraction. I for one cannot wait to read the second installment. Solid debut novel. I can't wait for book 2 to find out what happens next. To be honest I started this book then put it down. I wasn’t in the right mind set. It was the best decision I could have made because after going back and rereading from the start again I devoured it. The story is centred around Faye and Ace..enough said! 😂 Not really...Ace is not supposed to stop the demons from killing Faye but that is exactly what he does. He goes steps further by taking her back to his realm and by falling for her. The basis is still the same though...good versus evil....two To be honest I started this book then put it down. I wasn’t in the right mind set. It was the best decision I could have made because after going back and rereading from the start again I devoured it. Fast paced, gritty, plenty of twists and turns and some wonderfully colourful characters. This age old story of heaven, hell and everything in between had me gripped from page one and after that ending, I am definitely delving into book 2 to follow the way the story flows and the relationships develop. This book was good plenty of drama,romance and action. There isn't any one bit of it that I would change, the only complaint I have is it didn't grip me. I found myself putting the book down and wanting to read something else in between. This is a brilliant start to the trilogy, storyline is gripping and all characters are expertly described. I was so into the book that when the author killed off a certain person I actually was shouting at the book .Totally and utterly enjoyable read. This was a very good book. There were a few grammatical errors. But otherwise amazing. The characters were great!!! I can't wait to read the next one. I love the way Kate Bonham brought the characters together. A great read from start to finish. Where do I start with this one, well for one I absolutely loved this book!!! Kate’s writing is phenomenal and like nothing I have read before. I was captured within the first couple of pages. Fate is book one in the fallen from Grace Series and is the story of Faye and Ace. This is a unconventional paranormal love story between a feisty female and a fallen angel, Fate takes you into a world with Angels, Fallen angels Arch angels and demons, it shows you all the factors that make the balance betwe Where do I start with this one, well for one I absolutely loved this book!!! This is a unconventional paranormal love story between a feisty female and a fallen angel, Fate takes you into a world with Angels, Fallen angels Arch angels and demons, it shows you all the factors that make the balance between heaven and hell and the thin line between good and evil and the acceptance of others. This book has everything, strong friendships, family rivalry and passion. Kate draws you in to this world with her fast past writing and lots of twists and turns which will keep you up reading all night long, I don’t want to give too much away in this book because it is a must read but I will say I laughed, fell in love with the characters and also cried BIG UGLY TEARS!!!!!!! I highly recommend this book whether you love paranormal or not as this book will convert you, I for one will be following up with book two Uprising!!! I've had this bad boy in my kindle app for months, always meaning to read, but never actually getting the chance. GOSH how I wish I had read it earlier on, but then again maybe not. I would have had to wait to long in between books for the rest of the series, book 3 is due to be released next month... eeekkk! 'Fate' is Kate Bonham's debut & first book in the "Fallen from Grace" series, I can honestly say it was devoured. I couldn't stop! Within the first chapter I'd become addicted to Faye & I've had this bad boy in my kindle app for months, always meaning to read, but never actually getting the chance. GOSH how I wish I had read it earlier on, but then again maybe not. I would have had to wait to long in between books for the rest of the series, book 3 is due to be released next month... eeekkk! 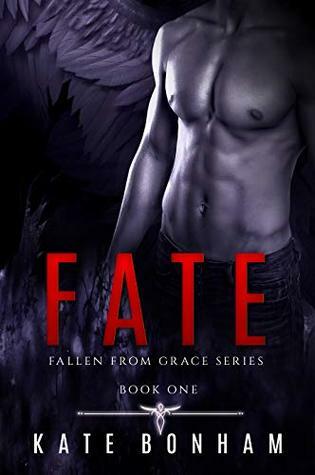 'Fate' is Kate Bonham's debut & first book in the "Fallen from Grace" series, I can honestly say it was devoured. I couldn't stop! Within the first chapter I'd become addicted to Faye & Ace's lives & the events that brought them together. I don't want to ruin this book for you, so I wont give away any story line, just know that if your a fan of the paranormal genre, this book & series is for you. It was a thrilling read, keeping me enthralled, surprised... this fast paced read is filled to the brim with twist, turns, action, steamy scenes... making you laugh, cry & fall in love with the characters. Kate has produced a reasonable story for her first novel and I am interested to read what happens in the next installments, this is a series I think will be enjoyable. So why did I only give it 3 Stars - just lets say that her editing team and her beta readers did her no favours. Ace is a reaper for Purgatory; calming lost souls while they await their final judgment. His latest Death Report was a job like any other, until he interrupts the demons that have been unleashed to kill her. Sh Kate has produced a reasonable story for her first novel and I am interested to read what happens in the next installments, this is a series I think will be enjoyable. So why did I only give it 3 Stars - just lets say that her editing team and her beta readers did her no favours. Fate takes us on a magical journey of forbidden love, war, loss and devastation... A really fast paced book that you wont be able to put down. I really loved the characters; Ace was not what I would call an alpha but maybe something better... he wasn't afraid to show his feelings, be they good or bad and I found that really attractive. Faye; WOW! One badass chick! Kate has woven together a story full of twists and turns that will have your jaw hitting the floor and you're eyes we A brilliant debut! Kate has woven together a story full of twists and turns that will have your jaw hitting the floor and you're eyes welling up. Her take on Heaven and Hell and that in-between place was vividly written and her take on 'The Fallen' was refreshing. This book had it all. The only thing holding it back from a 5 star for me was that it changed pov's without warning and this threw me a little bit. This is a fast paced book in which good/bad and heaven and hell fight against each other. We meet Faye who absolutely awesome. Faye is on a speed dating cruise with her friend Cassandra. We then get to meet Ace who is a reaper and has been sent to get Faye. Ace and Faye's relationship has so many ups and downs, twists and turns that will keep you reading. It will make you cry, excite you and massive book hangover it ends on. Roll on book 2. The way Ms Bonham writes really draws you in and you actua This is a fast paced book in which good/bad and heaven and hell fight against each other. This was my first read by this author and I loved it. It was a great twist on a very familiar story for most of us. It does kind of leave you hanging there at the end so be sure to grab the next book in this series! I know I will!